Lake Malawi in East Africa contains a remarkable array of Melanoides gastropods. 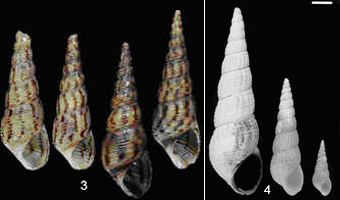 Considerable diversity in shell patterning, coloration and shell morphology can be found in littoral habitats, and historically as many as 38 distinct species have been described from the lake. Using a combination of population genetic and phylogenetic approaches, we found that the apparent high sympatric diversity is largely a consequence of the coexistence of multiple phenotypically-different clonal lines. Moreover, we found that three ancient evolutionary lineages were present that diverged prior to the formation the lake. Two of these lineages are native to East/Central Africa, while a third is an invader with Asiatic ancestry that appears to have colonised the lake during the last 30 years. This alien lineage has spread rapidly around the lake, and is now the most abundant gastropod present at many sites. It is possible that the invasive lineage has achieved numerical dominance through resistance to trematode parasites that castrate and induce gigantism in indigenous Melanoides. 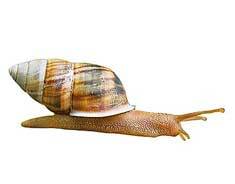 Consequences of this invasion for the indigenous gastropods and ecosystem functioning are currently unclear, although research has begun to investigate food web relationships of the gastropods. Figure 4. Giganticism in Melanoides.